Eden Hazard has credited Maurizio Sarri with prompting his most prolific season in Chelsea colours. Hazard's brace against West Ham on Monday – including a stunning solo effort in the first half – were his 15th and 16th goals in the Premier League this term, matching the tally he recorded on the way to his second title with Chelsea in 2016-17. HAZARD: "MY HEAD IS WITH CHELSEA"
With five games remaining to improve upon that number, starting with Sunday's keenly anticipated trip to face leaders Liverpool, the Belgium playmaker has lavished praise upon head coach Sarri. 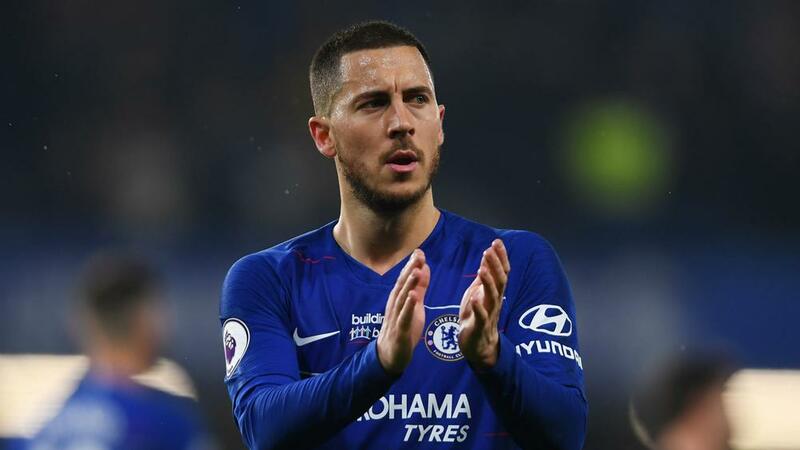 "Statistically it's my best season, and I like to say that because the way he's [Sarri] thinking is the same way I think about football," Hazard told BBC Football Focus, despite a debut season in the England's top flight that has seen Sarri garner mixed reviews. "Sometimes we have lost but, at the end, the way he wants to play is the way I want Chelsea to play." Hazard continues to be linked with a move to Real Madrid and again expressed his admiration for Los Blancos boss Zinedine Zidane in an interview with RMC Sport. However, he also holds Sarri in high regard and praised the ex-Napoli coach's attacking ambition following the more prosaic approach of predecessors Jose Mourinho and Antonio Conte. "I think he is a fantastic manager. After Conte it was not easy," Hazard said. "He came here with his own ideas to play football and I think we have done quite well. It's not simple to play the football he wants to play but I think now we have started to understand. "We are working a lot because this manager is different to Conte, he's different to Mourinho. "It's not easy to change everything but I think we have showed in the past two or three weeks that we have adapted well, and now we want to finish the season well." Asked about his own future, Hazard stuck to his familiar line of giving little away. "I don't want to talk about that. I am focused on the last month with Chelsea and then we will see what happens," he said. Hazard is under contract at Stamford Bridge until 2020, with the club's pending two-window transfer ban expected to have an influence upon his next move.